On January 3, 1825, Robert Owen purchased the town of Harmonie, Indiana, from religious leader George Rapp. Rapp and his followers returned to Pennsylvania, and Owen's utopian society got off to a big start. Portrait of Robert Owen by John Cranch, 1845, by permission of the Indiana Historical Society. Between 800 and 900 people arrived during the spring of 1825, and in a newly established newspaper, the name "Harmonie" was replaced by "New Harmony." However, the experiment was not at all harmonious. Within two years, Owen had returned to England, where his reform movement continued to gain momentum, peaking in about 1839. Back in New Harmony, Owen's influence continued through five of his children who lived there and through William Maclure, who attracted scientists and educators to the little town. As a child, Robert Owen left his native Newtown, Wales, joined a brother in London, and was apprenticed to a clothier in Stamford, Lincolnshire. The three-year plan included board and lodging, with no pay the first year, 8 pounds the second and 10 pounds the third. "These terms," Owen wrote, "I accepted ... I from that period, ten years of age, maintained myself without ever applying to my parents for any additional aid." Having thus started as a shop assistant, Owen moved upward, becoming, at age 20, the manager of one of the most modern cotton mills in Manchester. In 1796, he served on the Manchester Board of Health, an experience which no doubt put Owen in touch with widespread wretchedness and helped shape his ideas for social reform. In 1799, representing the Chorlton Twist Company, Owen purchased the cotton mills at New Lanark from David Dale, and then became, on the first day of 1800, the manager of the largest cotton factory in Scotland. The name Dale has been associated with the Owen family ever since Robert Owen married David Dale's daughter, Anne Caroline Dale, on September 30, 1799. They named their children Robert Dale, William, Ann, Jane Dale, David Dale, Richard, and Mary; subsequent generations of Owens have kept the name to the present day. I sounded my father by first asking him what he thought about Jesus Christ. His reply was to the effect that I would do well to heed his teachings, especially those relating to charity and to our loving one another. This was well enough, as far as it went; but it did not at all satisfy me. So, with some trepidation, I put the question direct, whether my father disbelieved that Christ was the son of God. He looked a little surprised, and did not answer immediately. 'Why did you ask that question, my son?' he said at last. 'Because I am sure - ' I began eagerly. 'That he is God's Son?' asked my father, smiling. Did you ever hear of the Mahometans?' asked my father, while I had paused to collect my proofs. I replied that I had heard of such a people who lived somewhere, far off. 'Do they not believe the Bible?' asked I, somewhat aghast. Of the 2,000 people in New Lanark, 500 were children for whom there was no room in overcrowded poorhouses and charities in Glasgow and Edinburgh. Many of these children worked in the mills and had been well provided for by David Dale, who, in 1796, had written to the Manchester Board of Health that of the 500 children, eighty could read, twenty-four well enough that no further instruction in reading was needed. Owen extended Dale's precedent and in 1816 opened at New Lanark the first infant school in Great Britain. Owen also improved the housing at New Lanark, encouraged the people in personal order, cleanliness, and thrift, and opened a store with fair prices and limited sales of alcoholic beverages. His successes stood out among many failures elsewhere in Britain and Europe under the dark shadows of the industrial revolution, unemployment, crime, and poverty. Based largely on his successes at New Lanark, Owen emerged as a leader of social reform. Frank Podmore, Robert Owen, a Biography, v. 1 and 2, London, 1906. Joyce M. Bellamy and John Saville, Dictionary of Labour Biography, vol. 6, Macmillan, London, 1982. One of Robert Owen's mottos, which appeared in the masthead of New Moral World, was that "The character of a man is formed for him, not by him." Character-formation was a principal objective of Owenite education, legislation, "rational religion," and the building of communitarian villages such as New Harmony. 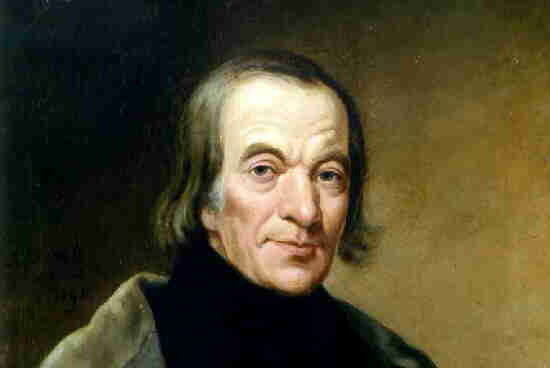 This image of Robert Owen was published in Manchester about 1840. 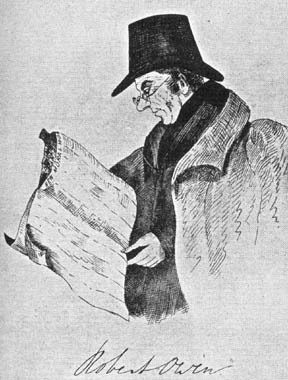 You can recognize Mr. Owen's paper as New Moral World, the primary Owenite publication in the 1840's. (A later version has Mr. Owen reading The Constitutional). Donald E. Pitzer, "The New Moral World of Robert Owen and New Harmony," in America's Communal Utopias, The University of North Carolina Press, Chapel Hill and London, 1997.